On this Thanksgiving Day I am thankful for many things. One of those is that I get paid to do what I love: teach kids. Some people choose a job over their passion, while others work side jobs to make ends meet while pursuing their passion. I consider myself lucky that my job is my passion. I know why I became an educator. As a matter of fact, I can tell you the person, exactly what he did, and the exact moment he did it that has led me where I am today. 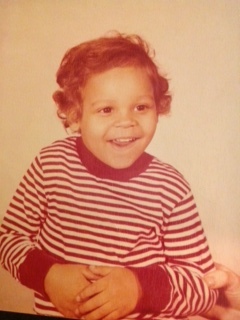 This is Sam LeDeaux, age 3. I was in pre-school. I was…an active child. You’ll notice the hand in the lower right hand corner of the picture holding me in place, and there was an accompanying voice demanding, “Sam, sit still!” I often had an adult very close to me at school. We had 3 teachers, and all students would rotate and interchange–well, everyone but me. I always had to be with Mr. Doug. Everywhere I went, Mr. Doug was right there. Mr. Doug was the “enforcer”, the teacher that got “all of those kids”. Despite running away from him daily, kicking and swinging, I actually liked Mr. Doug. As a matter of fact, I would always ask my mom if Mr. Doug could come over for a play date and have dinner with us. One day, I mustered up the courage to ask Mr. Doug if he’d come over for a play date and dinner, and he said yes. I couldn’t believe it! It was going to be a special afternoon. I lived with just my mom, and you could say we lived very modestly on a tight budget. However, I wasn’t going to let that prevent this afternoon from being as luxurious as it could be. Dinner options weren’t plentiful in our house. I decided to go with macaroni & cheese and hot dogs–no buns, just hot dogs (remember, tight budget). Mr. Doug came over, we played, and ate macaroni & cheese and hot dogs. We even used the nice paper plates! Whoa! Mr. Doug had come to my house! I went to school the next day, head up, chest puffed out, strutting my stuff. I was on top of the world. That was 34 years ago, and I remember it like it was yesterday. It drives me to this day, as I always think to myself, “What if I could do that for a kid in my school?? ?” What if I could make 2 kids feel like that? Or 5? Or an entire class? Or school? Wow, that would be awesome. I also think to myself, what if Mr. Doug had declined my invitation? What if he thought teaching only occurred during school hours in the classroom? Or what if he thought since he had to follow me around all day and spend every minute of the school day with me there was no way in HE** he was going to spend the evening with me, too?!? What if he told me yes, then at the last second remembered he had a dentist appointment the following morning, suddenly came into some unforeseen work to get done, and it was raining which would make travel to my house inconvenient and canceled on me thinking I’m only 3 years old and I’d get over it and be fine? Would I have gotten over it? Would I have been fine? I can never know that, but what I do know is that he made me feel special. He made me feel proud to be me. He showed me he cared. He made me feel like I was someone. And to this day, when things get heavy or I just have one of those days, I remember Mr. Doug, what he did for me, and why I became a teacher. I used to think about that in reflection (and still do), but now I keep it on a post-it note on my laptop so that I am sure to always remember why I teach kids. Can I positively engage with a kid today in such a way that will impact and drive what s/he’s doing 34 years from now? Can I do for my kids what Mr. Doug did for me? That motivation and desire is what drives my passion for teaching. We all have the opportunity to be somebody’s Mr. Doug. Posted by Sam LeDeaux on November 28, 2013 in Action, Discipline, Education, Humility, Learner, Prioritizing, Reflection, Student, Teacher and tagged accurate reflection, Conversation, Education, humility, learning, Preschool education, Prioritizing, Student, Teacher, teaching, Thanksgiving. Wow!! What a powerful message and mantra. I, too, want to be Mr. Doug for the children I serve. Thank you sharing your heartfelt story with the world. Thank you! It is important to remember why we do what we do. Thank you, Catina! It is important to remember why we do what we do. Hi Sam, My “Mr. Doug” is my 4th grade teacher, Miss Hall. I, too, was an … active child 🙂 and she never gave up on me, took me under her wing and saw potential in me that no one else cared to. She knew about my struggles at home and always made me feel special. Thanks for bringing back great memories for me..
Great Story Bro, and look at those locks! My Mr. Doug was a man named Mr. Hobbs. He only taught like one year, but it counted. Thanks, Emile. You think I’m bald? I choose to shave my head. I could have those locks in 3 weeks if I so chose. Glad to hear Mr. Hobbs made it count. That’s inspiration for me to make my time in education count. Thanks for the feedback! Wow. I hope that one day I can be someones Mr. Doug. Powerful message and sooooooo important for us all to remember. Happy Holidays, hope you all come back refreshed and recharged to make a difference for kids. Thank you for reading and commenting, Gary! Happy Holidays to you, as well! Sam, this post is amazing! You are such an inspiration and your students and staff are lucky to have you supporting them! 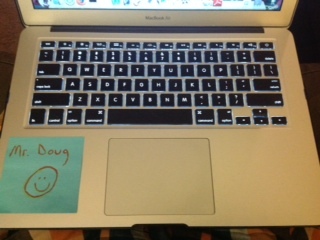 I love the post-it note reminder on your computer!